I share trusted baking recipes your friends will LOVE alongside insights into the simple science of sweets to ensure everything you bake is a hit. If the kitchen is your “happy place,” if you love to experiment and get creative, and if you love to watch the joy on someone’s face when they bite into your treats, then this is the right place for you. Simply put? Baking is nothing short of magical. Let’s make everyone’s life a little sweeter, one recipe at a time. So happy to have you here, because bakers are the best kinds of people! Sweet treats with a sprinkle of science. Hey, I’m Tessa Arias. I help people who crave a more delicious life. I have chocolate every single day. That’s not an exaggeration. I believe food is one of the most powerful ways to express and receive love. With that being said… I hate pickles and peas. No love for those here. I hope you enjoy your time here on my blog and find a recipe (or a few) that become family favorites. If you have any questions, comments, recipe requests, or are interested in working with me please contact me. The Ultimate Cookie Handbook (e-book) is available for purchase! It is an eBook dedicated to helping you bake perfect cookies every time by teaching you the science of baking in a totally easy visual way. If you’ve ever wondered what certain ingredients do (brown sugar vs. granulated), how to customize your cookies, how to troubleshoot them when they turn out wrong, or even how to create your very own recipes, this shows you how! Tessa’s Christmas Cookies (e-book) is a collection of my all-time favorite holiday recipes paired with baking secrets, decorating tricks, and creative ideas for packaging treats. Because who doesn’t love homemade edible gifts?! 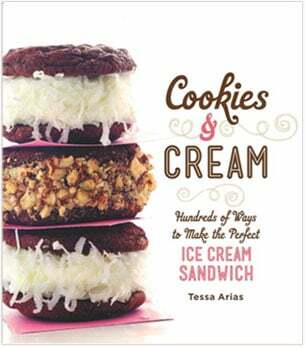 Cookies & Cream: Hundreds of Ways to Make the Perfect Ice Cream Sandwich (hardcover) features 50 recipes for homemade ice cream sandwiches with fabulous flavors like Red Velvet Cheesecake, Boston Cream Pie, and Cookies and Cream. It’ll make you feel like a kid again!your very own recipes, this shows you how! Do you want a more delicious life? Instead of digging through cookbooks and magazines and searching the internet for amazing recipes, subscribe to Handle the Heat to receive new recipe posts delivered straight to your email inbox. 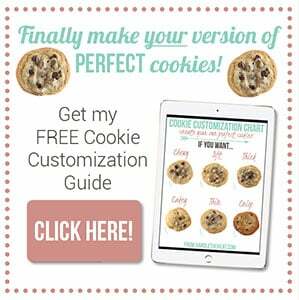 You’ll get all the latest recipes, videos, kitchen tips and tricks AND my *free* Cookie Customization Guide (because I am the Cookie Queen)!